Fall Rally Season is here! Delmarva Bike Week® 2017 is the first of four Fall rallies that Custom Dynamics® will attend this year! Delmarva Bike Week® was especially exciting for us this year as we unveiled our new Freightliner Big Rig! Set-up day was an experience to say the least. The new 2247 square foot canopy almost triples the size of the one it replaced! 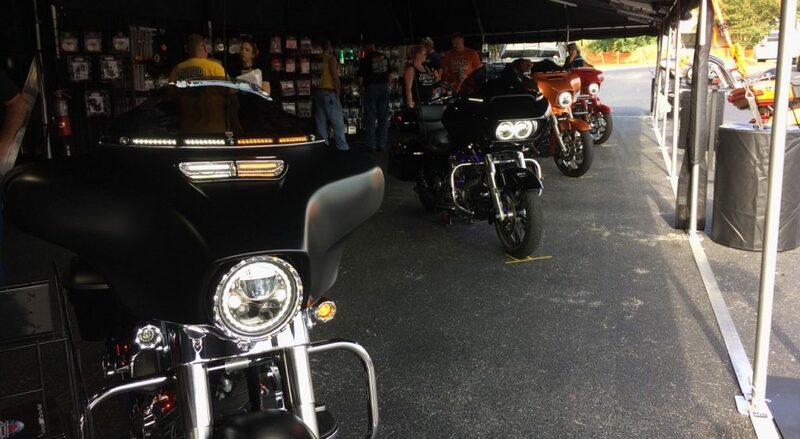 Delmarva Bike Week® held events at Salisbury’s Arthur W. Perdue Stadium (where we were set up) and Seaford’s Rommel Harley-Davidson®. Different vendors from the industry were in attendance; from patches to pipes there was something for everyone! Attending rallies is important to us. It not only offers hands-on experience with new models and fitments but is also another avenue to offer customer service and products to our customers! Custom Dynamics® was able to install on over 130 bikes between Thursday and Sunday! We appreciate all the customers who came to see us and look forward to seeing you at our next rally (Myrtle Beach Fall; Oct. 3 – Oct. 8)! You can find our complete Fall Rally schedule here. 2018 Delmarva Bike Week® (Sep. 13-16, 2018) details are available now! Thank you again to all our customers, Ride Safe!